Time for an BIG update! Firstly, Trails!, Although most of you know by now, a few trails have appeared in the server. I am planning to add further trails, and slightly improve the current ones. ( i want to make them a little more bolder ) I do plan to add different types and some more unique ones like the current rainbow one added. Currently there are 4 to choose from. Red, Green, Blue and the multicoloured rainbow trail. like VIP Skins previously used to work, they do require Active VIP days to work. Secondly, and the biggest part of the news is that we have our Custom Player Models back! Thanks to a massive help from N7Legion, we are once again able to have custom skins active in the server. And i can not thank him enough! He has kindly ported some awesome skins into ZPS, and they honestly look fantastic. As none of the previous skins work with the new ZPS 3.0, brand new models are going to slowly appear in the server over the next couple of weeks. I also have plans for a specific skin which was previously in our old mods for the veterans of JX Mod which will be a locked unique skin for top JX MOD Players Depending on the amount of skins we do manage to port across, there will be several other ways to gain unique skins, which i also plan to do with some upcoming trails. Currently we have the following skins! I will be personally adding new skins every week or two, and will be keeping the skin list up to date as much as i can! Please, don't spam at me suggesting a model on the server whenever I am on. If you have got any model you would like to suggest for, private message me on this forum instead. I (and probably Joux) will consider them. MAX CAULFIELD ! We Need Chloe Price Too ! In kotonoha we trust. Jk jk. Great job guys! Quick update on Trails and Carrier Skins! All of the trails have been updated and should appear more bold in game, with a big change to the rainbow trail. I have now made it randomly merge into other colours, rather than a different colour each frame(ish). I will be adding some more in the next few days and also a unique one to the VIP System ( as it has been waiting for people since the xmas event ) so keep an eye of for them shortly. The second update is for the Carrier skins, now i know they are not used as much as the Human skins so i have made a big addition to the system. VIPs will now have a returning feature of VIP Whitey. Which means, if you play the round as a starting zombie, you will always have your Carrier skin active. This again should hopefully make use of owning one of the carrier skins in game. While some new VIP skins are still being worked on, i have in the meantime made some new additions to the trails! Along with adding a new trail colour ( white ) i have also added a new option to add trail effects! This means you can now mix and match a trail and its effect to your liking. Also, over the next few days, the VIP System which controls these trails will also be added to EU1 & 2 ( Skins will currently be disabled however ). This will also enable member commands in those servers. While the VIP skins aren't getting worked on, it's time to say this here that I am not doing any skins for now, due to lack of my motivation. I am sorry for those who wanted to see more. As a man who has place multiple issues of malware on Joux's computer in order to spy on him (As I very clearly "Do Nothing For The Server) And as such have insider information, I can tell you that Joux has started to learn how to model. He has currently started to play around with models and they will continue with his overqualified hands. Indeed, while I have been working on some new skins this week myself, i am pleased to announce a new skin added to the server! ( and will be now adding them individually every week or two to keep things fresh ) . This skin has been added ( Rey ) as an in-game obtainable VIP Skin and is now Active in EU3. As always, i will update the thread with screenshots in a few days and may the force be with you. This post was deleted by the author themselves ( May 7th 2018, 1:23pm ). 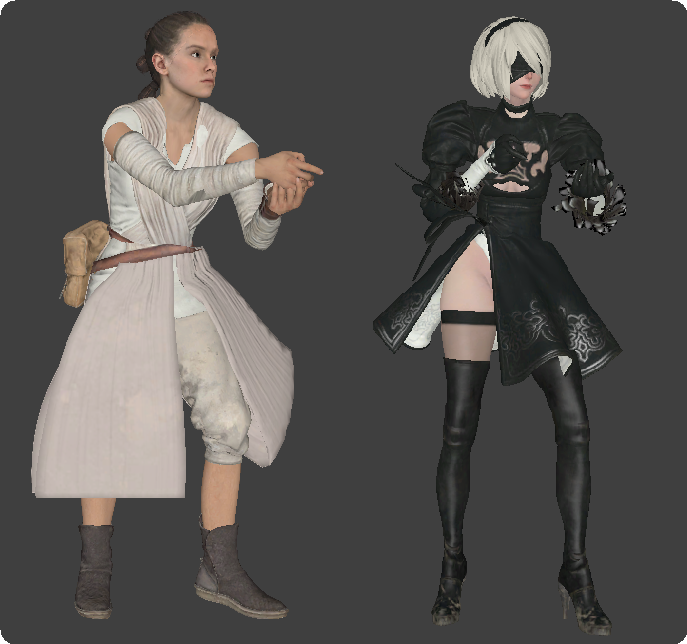 ( 2B ) VIP Skin has been added! this can be bought in-game as well as won from the VIP Area! I will be adding new trails next week which will also be added to the VIP Crates. Would be nice to have pictures of each model on the donation page, to see what you actually unlock. Looks good mate, where the wolfie though?